The Red Fort Complex was built as the palace fort of Shahjahanabad – the new capital of the fifth Mughal Emperor of India, Shah Jahan. Named for its massive enclosing walls of red sandstone, it is adjacent to an older fort, the Salimgarh, built by Islam Shah Suri in 1546, with which it forms the Red Fort Complex. The private apartments consist of a row of pavilions connected by a continuous water channel, known as the Nahr-i-Behisht (Stream of Paradise). 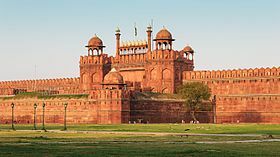 The Red Fort is considered to represent the zenith of Mughal creativity which, under the Shah Jahan, was brought to a new level of refinement. The planning of the palace is based on Islamic prototypes, but each pavilion reveals architectural elements typical of Mughal building, reflecting a fusion of Persian, Timurid and Hindu traditions The Red Fort’s innovative planning and architectural style, including the garden design, strongly influenced later buildings and gardens in Rajasthan, Delhi, Agra and further afield. This article uses material from UNESCO World Heritage List article "Red Fort Complex", which is released under the Creative Commons Attribution-Share-Alike 3.0 IGO License.